Weligama (Sinhalese: වැලිගම, Tamil: வெலிகாமம்) is a town on the south coast of Sri Lanka, located in Matara District, Southern Province, Sri Lanka, governed by an Urban Council. 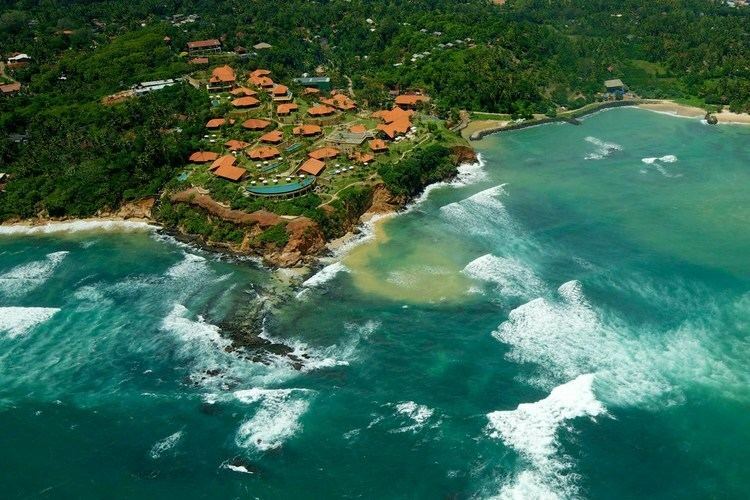 The name Weligama, literally means "sandy village" which refers to the area's sandy sweep bay. It is approximately 144 kilometres (89 mi) south of Colombo and is situated at an elevation of 9 metres (30 ft) above the sea level. There are a number of sites of historical importance within Weligama and its vicinity, including a 3 metres (9.8 ft) high bas-relief statue of Bodhisattva Avalokiteśvara, carved into the surrounding rock, between the 6th-9th century AD. It is known locally as Kusta Raja Gala or Rock of the Leper King and is thought to represent a king smitten with a skin disease (prossibly leprosy "kusta"), who was prompted in a vision to take coconut pulp and water for three months as a cure. When he fulfilled the vision his health was restored, he then commissioned his figure to be carved on the rock commemorating this miraculous cure. This sculpture is believed to be all that is left of the old Agrabodhi Vihara that was located there. Weligama is located on the Coastal or Southern Rail Line (connecting Colombo through to Matara), and the A2 highway, connecting Colombo to Weligama.